Please don’t be upset with me. We are finally getting the long-awaited snowstorm, and it makes me so happy! A winter that doesn’t act like winter makes me uncomfortable. Winter should know its place and behave accordingly. Snow. Cold. Frozen ponds and lakes. Are you with me on this? I’m not sure the sheep are, but they’re designed for this kind of weather. Built-in winter coats? Sunny Florida is not the place for them, they belong right here where the cold will encourage them to grow long and heavy fleeces. And you know what that means, plenty of scrumptious Blue Face Leicester wool for me to spin and knit with. So……let it snow, let it snow, let it snow! I think I actually see a smile on the sheep’s faces, don’t you? 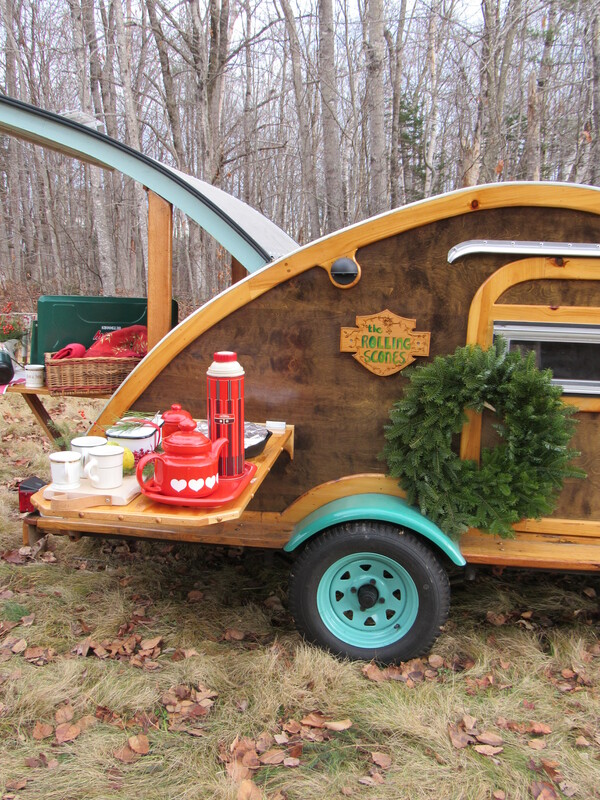 We decided to roll out the teardrop trailer for one last adventure before the snow flies. We will get some snow, won’t we? I am counting on that, you know. 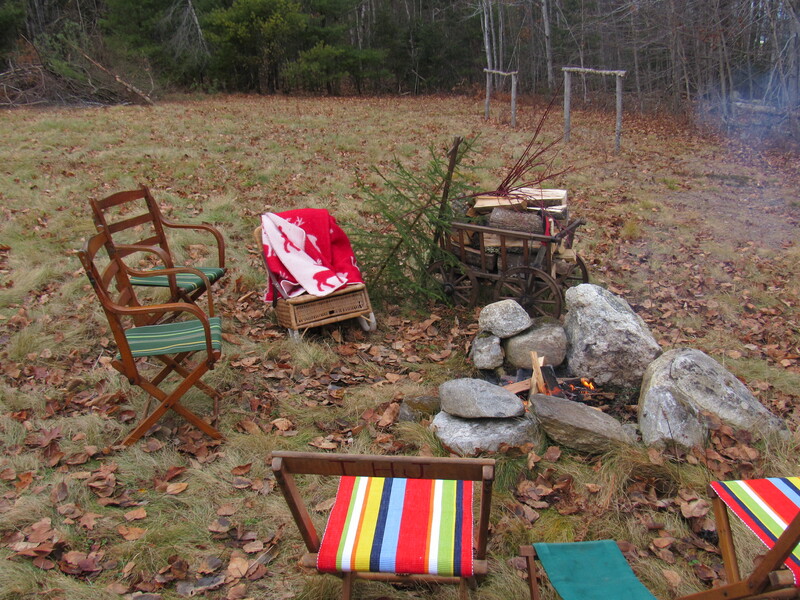 This warm weather, however, did allows us to hike up into the field to have a little camp out. I made a stew with some turkey and sausage, and a skillet of cornbread with cheddar and caramelized onion. Not too shabby for a meal around the campfire. 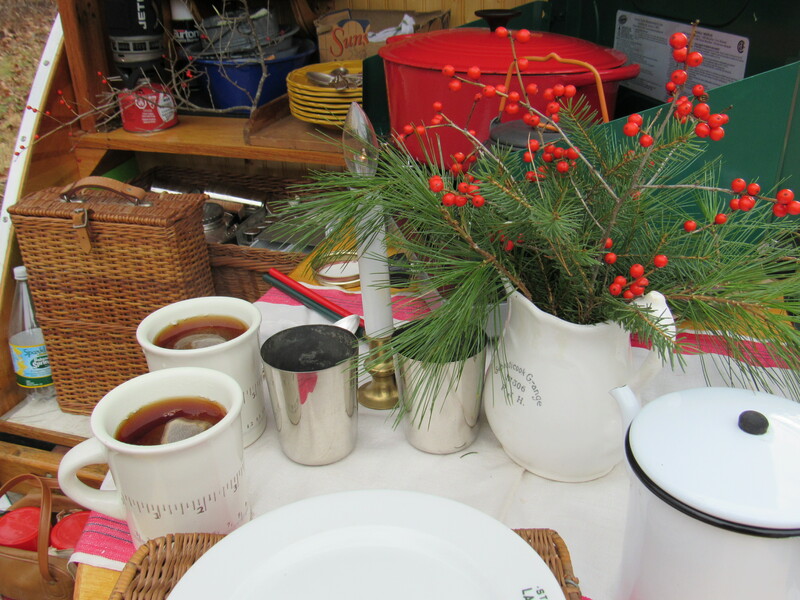 There was tea, of course…always TEA to go along with any TEArdrop adventure. Here are some photos of that perfect afternoon in December…..
For years …as long as I have raised sheep, over twenty five years now, I have been searching for the perfect woolen mill to process some of our fleeces. We always keep a bundle of the newly shorn fleeces here to process ourselves, the rest will often get sent off to be cleaned and carded. This means bags of beautifully cleaned roving returns, ready to spin. The last two years I’ve even sent off several fleeces to have them cleaned, carded, and spun into yarn. 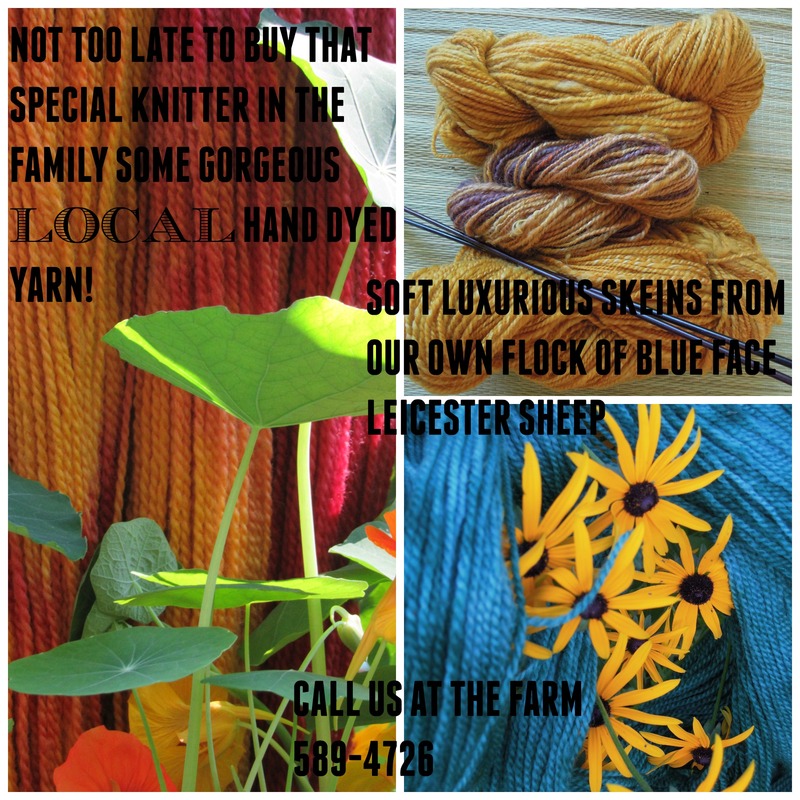 So I have both available……skeins of our Blue Face Leicester spun right here with me at the wheel or yarn from our sheep that has been sent over to the Battenkill. Even with any mill spun yarn, I still do all the dyeing of each skein. With a flock of sheep’s fleeces piling up (I can only spin so fast and there is always so much else to do…surprise, surprise, huh?) I decided two years ago to send some of the fleeces off. This allowed me to have more inventory to sell to our yarn customers. 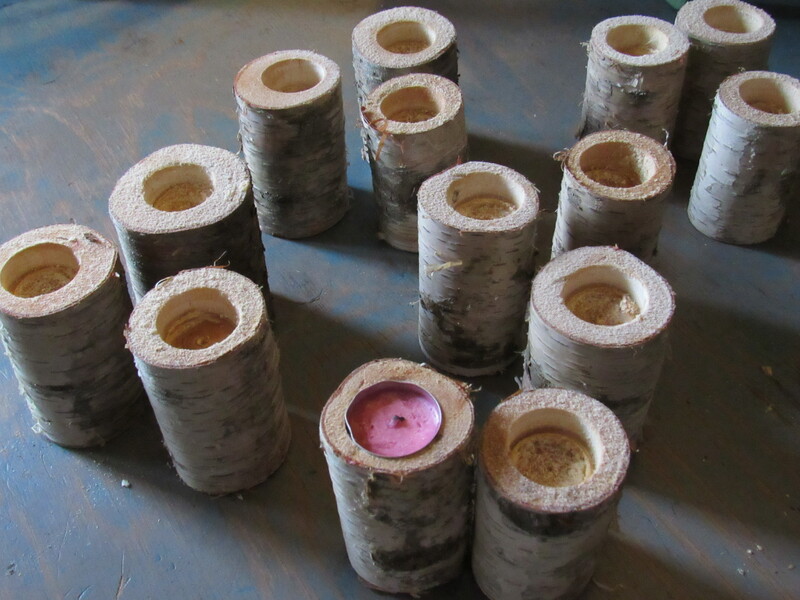 Finding the right woolen mill has always been a challenge. For years we’ve had a local mill who did a great job, but they no longer clean fleeces, and because ‘cleaning’ the fleeces is the job that is most helpful, I began looking elsewhere. It’s not easy to find a mill you trust. Being a handspinner and working hard to maintain the quality of our sheep and their fleeces, I don’t want to risk sending them just anywhere. I had one mill years ago lose all of my 1st year lamb fleeces. Not happy, I can only say. Blue Face Leicester tends to have a fairly long staple length (length of the locks), it is quite crimpy, and often contains a fair bit of lanolin. This can gunk up a machine, so carefully washing is important. Some cottage mills are not able (or talented enough) to handle fleeces that are considered extra fine , like Merino or Rambouillet, or they are not able to slow the machines to handle a long stabled fleece…like Blue Face Leicester. Owning and operating a woolen mill is a craft. They need to understand the different wool breeds, they need to be able to assess the fleeces when they come in, and they need to be able to process each order to the customer’s request. There is a lot to pay attention to. So, this is why I am promoting the Battenkill Fiber Mill. They are, by far, the best mill I’ve come across. One of the great things about them is that they strive for accuracy. I get my own fleeces back and the weight of the finished product is always on the high end. They are great communicators, I often send my fleeces with a ( fairly) long list of instructions and thoughts…. 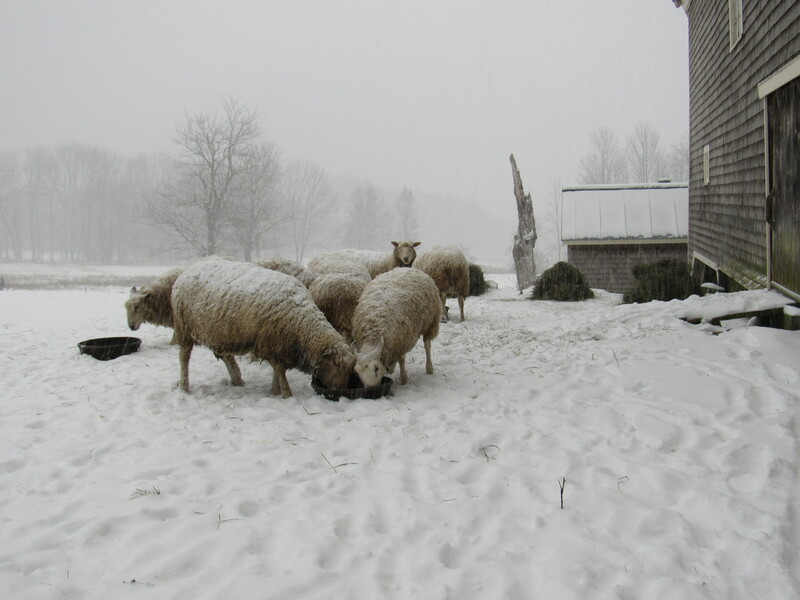 the folks at the Battenkill know that they are working with producers that care about their sheep and the end quality of their fleeces, and so they listen. Quality is first and foremost at the Battenkill. I have been so happy to find a mill, one that is not across the country, that I can trust with my fleeces. They really are an excellent mill. Recently, I received an email from Mary Jeanne who owns and operates the Battenkill Fiber Mill. She sends out a yearly update of things happening at the mill, along with this great video which explains how the mill operates. The best part of the video is learning a little bit about the happy folks who work there. If happy and contented people are doing the job of processing your fleeces, it makes sense that they come back to you reflecting the happy hands that handled them. Check out the Battenkill’s website, the video is there to click onto……join in with supporting a great little business! 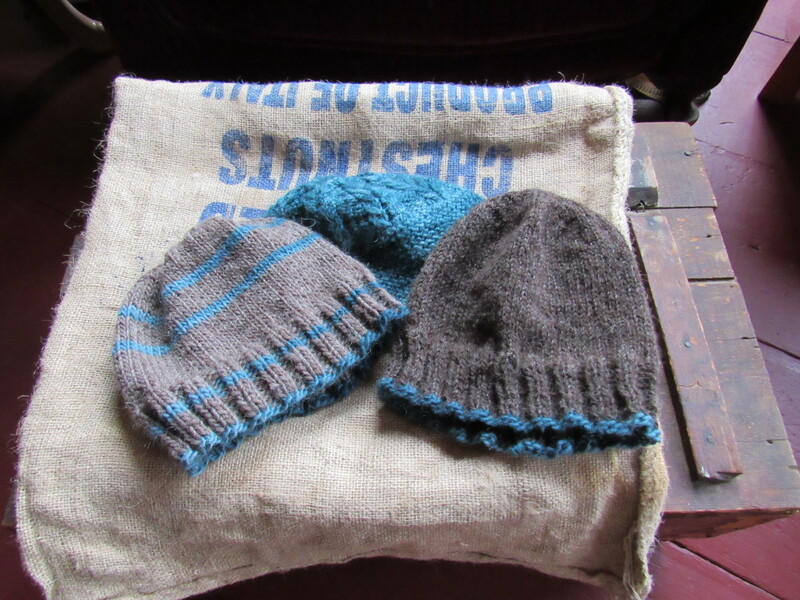 One of the things I do to bring some balance to the very physical needs of our life here at Fernwood, is to knit. Well, first I spin, then I knit. This craft of being relatively still, allowing my mind to get lost in the making of stitches, and the methodical nature of needles twisting and clicking, is a gift onto the day. Slow. Restful. Restorative. I really like these words written by Naomi Nye, I’m impressed that she saw the humble craft of needle work worthy of a poem. The ending message, however, also made me feel grateful for the rural community I live in. 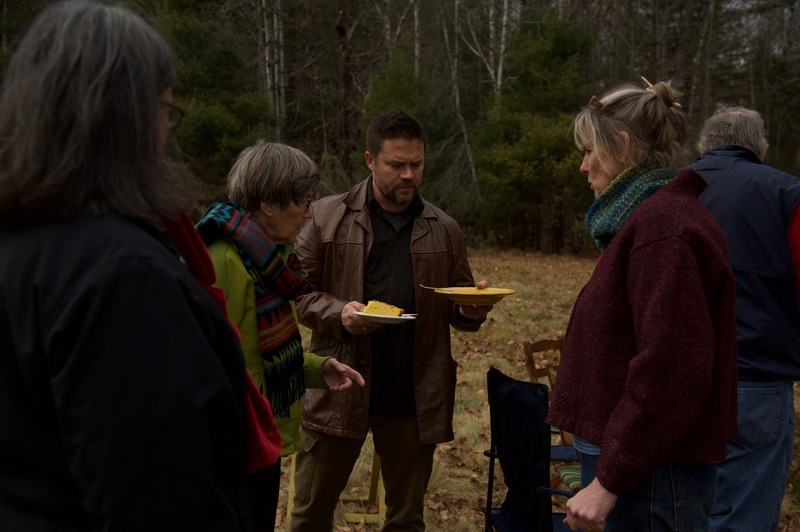 Here, in the north east part of New England, knitting and crocheting….mending a patch in a flannel shirt, are a part of our language. Seeing someone take out their needles in public in order to make some gain on their knitting project, opens the door for conversation. “What are you working on?” “What kind of yarn are you using?” ” Oh, I love those colors!” , these are all things you might say when one handcrafter bumps into another. We can’t help ourselves, it’s a strong tie. Yesterday, I spun some of the first angora collected from my friend Sally’s rabbit. I’ll be using that soft and silky yarn in the headband I’m knitting for a friend’s Christmas present. Oh, this wondeful art of sewing, knitting, and crocheting, …..spread the word! grows into a hat with a tassel. She looks young to crochet. I’m glad history isn’t totally lost. Her silver hook dips gracefully. Her stitches must be invisible. A bevelled thimble glitters in the light. between La Guardia and Dallas. A Stocking Stuffer That May Earn You A Pair Of Knitted Socks…. Still time to fill a little room in that Christmas stocking. 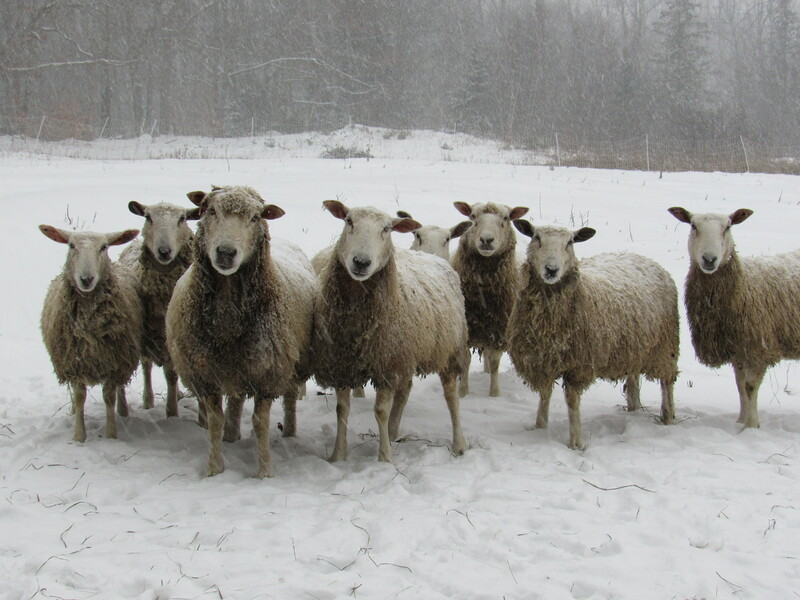 There’s a happy flock of sheep here at Fernwood who have generously offered up their cozy wool. It’s all spun up in a range of great colors, and ready to be featured in your next knitting project. 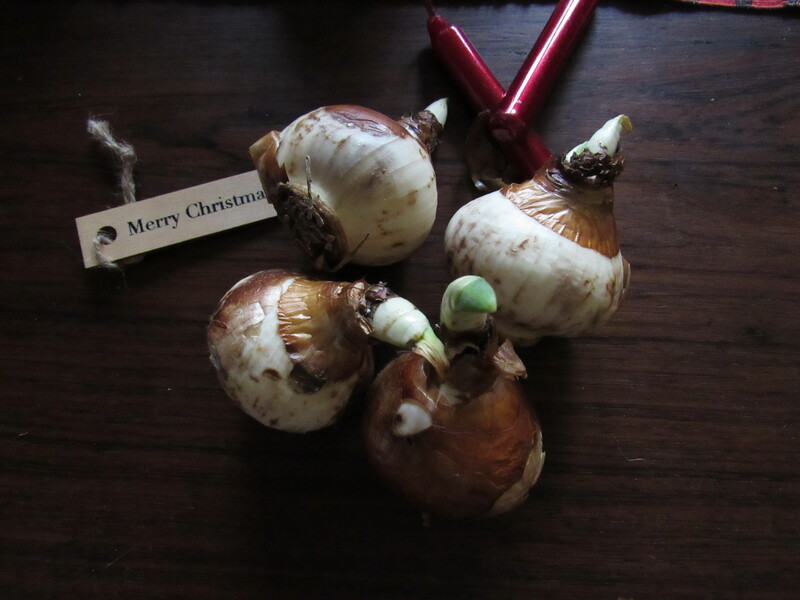 Call us here at the nursery or email us if a skein or two happens to be on your Christmas wish list. Happy Holidays everyone! 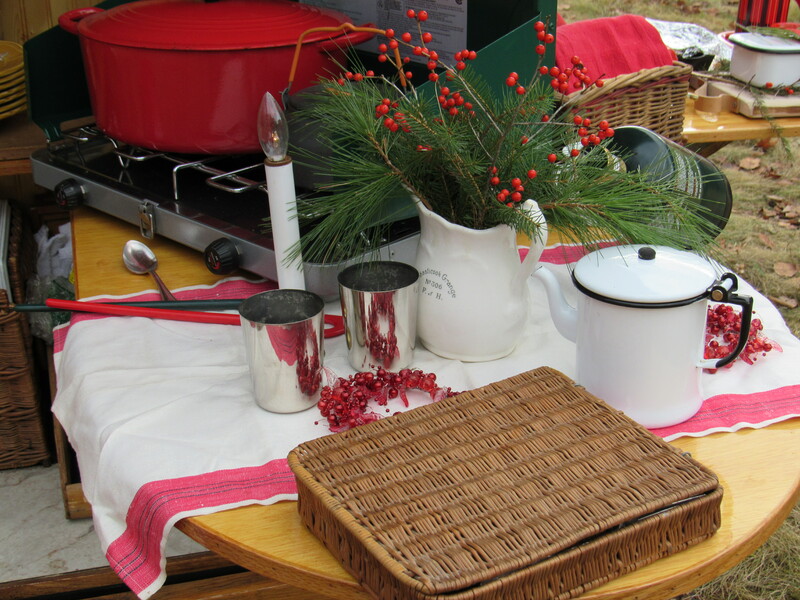 I find that we often refer to the gifts that come with our living the life we do here at Fernwood. 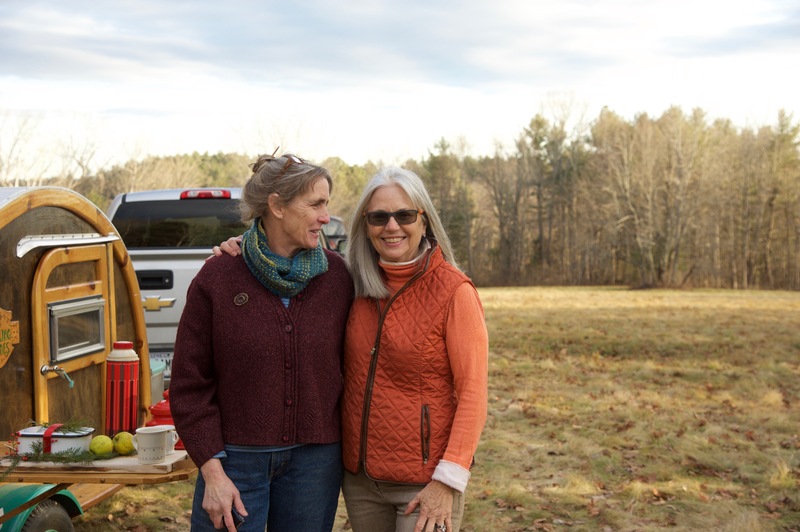 All of the things that keep us engaged and happy here…..our time together, providing our household with the food we grow, doing work that we love. Pretty amazing gifts. 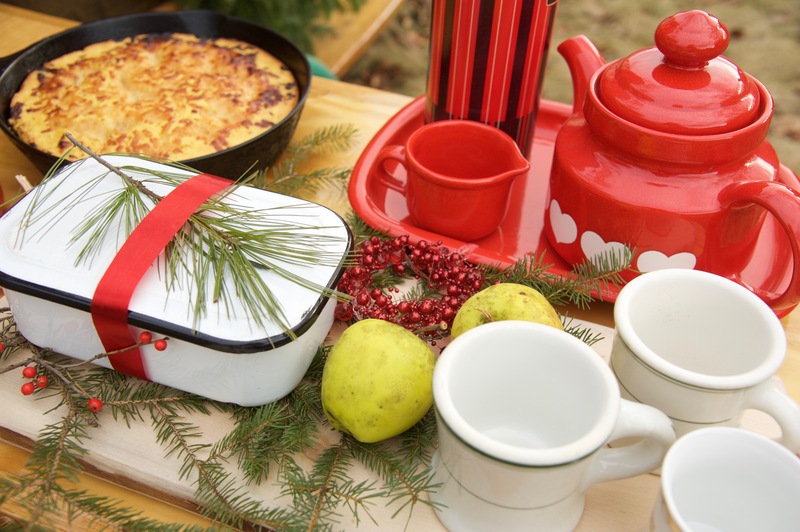 But today, as we near that moment of gift giving that will have us up in the wee hours, still in our pajamas, and sipping our freshly brewed coffee underneath a lovely balsam fir that has been brought inside, I want to mention the gifts that will be thoughtfully packaged underneath that tree. Have you ever heard someone say that they don’t like Christmas? I have. I think the Christmas holiday (for some) can bring on a bit of panic, and expectation, and some disappointment. I can understand this, our world has gone ahead and taken a moment in the year that should reflect the importance of peace, joy, and love, and created an occasion for emotions that aren’t at all very reflective of these things. The panic, the feeling of not having enough time, the craze of buying too many gifts to bestow on someone, which also can require loads of money …for what? I always shutter at this, and feel quite certain that if we had to ‘do Christmas’ this way, I’d feel pretty overwhelmed as well. But we don’t. I love this time of year. I love the reflection it can bring. I love making a gift , knitting a hat with wool from our own sheep for a neighbor or friend or loved one, a token of my appreciation for their very presence in my life. I think about them as I sit quietly forming those stitches, happy also to think that this gift will become a symbol of my love and fondness for them. I like feeling that this warm wool hat will help to keep their noggin warm when it’s 20 below. 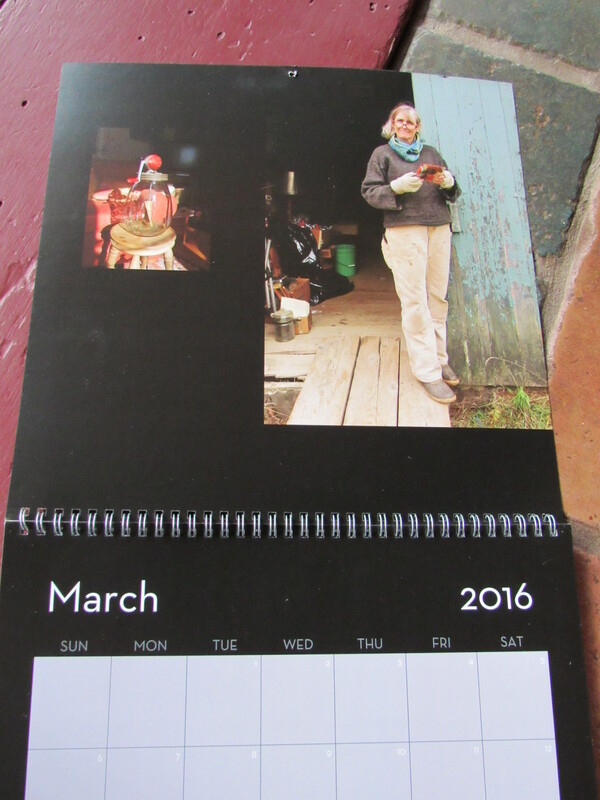 I was gifted a page in the calendar, too! The gifts I love best are always the ones that are personal and thoughtful. 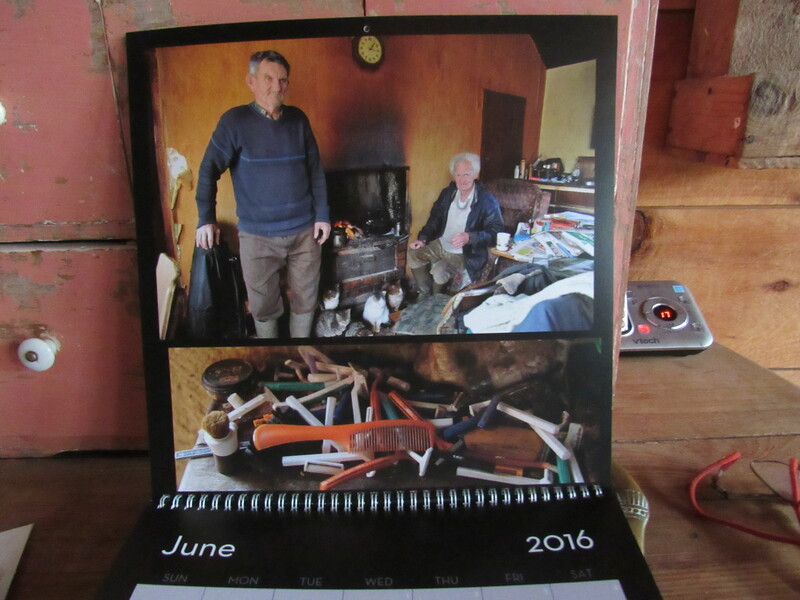 Yesterday I was given a beautiful calendar from my dear friend Sally. It was made up of the photos she had taken throughout the year, pictures of our travels together, moments we’ve shared on our adventures, all reminders of the great times we have, and the love ( and fun!) our friendship brings to one another. I keep flipping through the months, looking at the pictures, and being reminded of all those moments. A Very thoughtful gift, yes indeedy. We feel fortunate that the kids have always had a good handle on Christmas, what it means to us as a family, and how we choose to spend it. We all agree that the meals and time we share together are irreplaceable. We’ve all been in the habit of making gifts for one another, or regifting things, or repurposing old items to create something new and special. We buy some things as well…not much, but we’re not against finding a little ‘something special’ to place into our stockings. Chocolate. A book. A box of tea. One year Zoe tracked down the very shoes I wore and loved in high school ( a pair of leather Clarks), bought them and put them under the tree. The thought of her listening to me fondly reminisce about those shoes, and then searching to find them is so touching…I’m still wearing them! When Noah was twelve and I asked “what might be nice for you at Christmas” and asked him to write it down, he left a slip of paper on the table for me. There were two items, numbered 1. and 2. The first was a welder, the second was ‘scrap metal’. That’s what he got, a used welder gifted to us from an old friend and a pile of scrap metal. He was delighted. 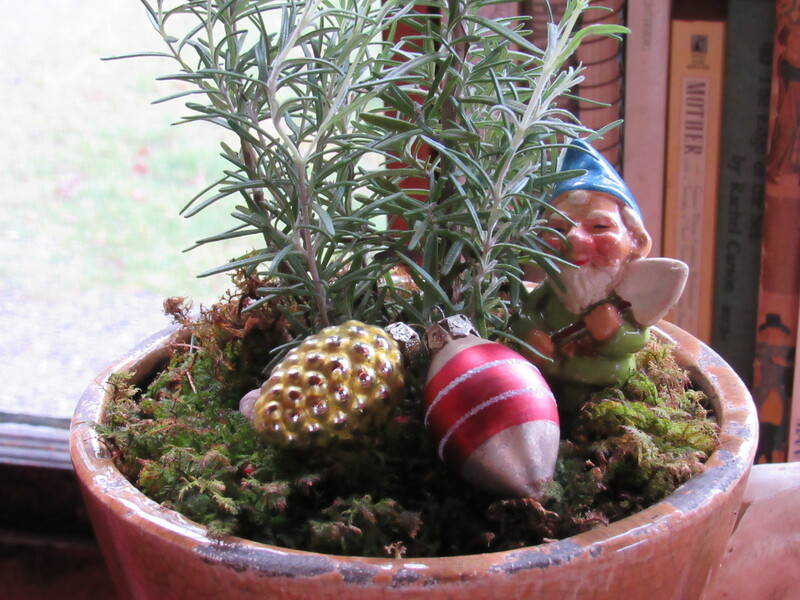 A pot of rosemary and some festive trinkets (found) for a dear gardening friend of mine…who also loves to cook. If I could wish for one thing this Christmas, it would be to slow time up a bit. I’d like the 31 days of December to be spent thoughtfully, one day at a time, with each and every person I love. There is some magic to Christmas. There is ceremony. There are lovely gifts to give and receive. I hope everyone makes the most of this holiday season and finds just the right way to spend their Christmas. Did I mention that we have an angora rabbit living with us now? Hunny Bunny actually belongs to my friend Sally. He has recently become another winter resident here at the nursery. He is sweet and friendly and spends a great deal of time exploring the nooks and crannies of our household. And guess what……. in-house angora fiber to spin!!!! How cool is that! 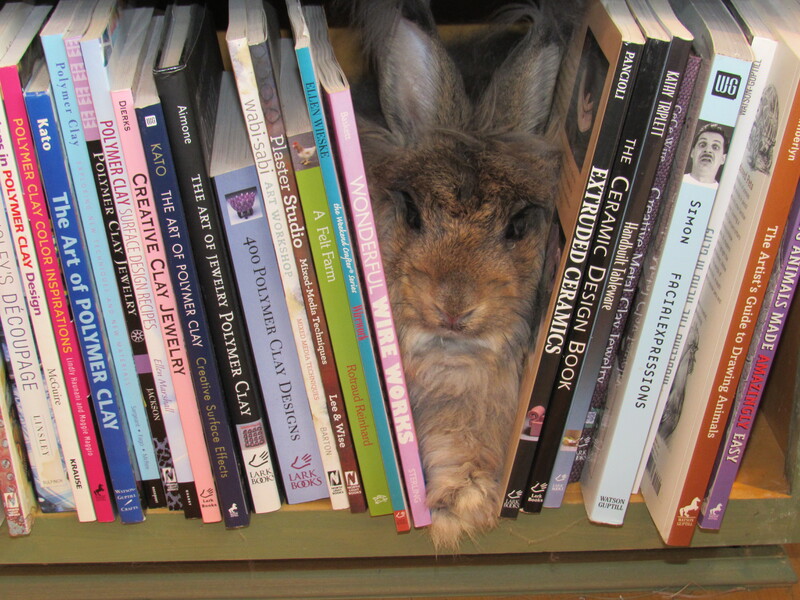 One of Hunny Bunny’s favorite resting spots is among the art and craft books. Who doesn’t like to curl up with a good book? His fur is very soft and silky, and is a wonderful silver color . After spinning up several bobbins of this luxury fiber, I’ll use most of it for knitting winter headbands. The soft angora is perfect for the inside lining of a wool hat or headband, and it doesn’t really itch like wool. I’ll finish the one I’m knitting up for a Christmas gift and post some pictures. This past weekend was our date for processing the pigs we’ve raised. Growing and raising our own food continues to be a significant part of what we do here at Fernwood. Another form of our ‘home economy’ happens to be the meat we put into the freezer. Now that the nursery is closed for the season, the vegetables all harvested and preserved, the firewood in, and the hay stored, it is time to fill the last freezer with this year’s pork supply. The days we slaughter animals are never really pleasant ones. We know what we’re in for. We’ve raised these critters and because we are committed to following through with the whole process of raising our own meat from start to finish, it is certainly a day of thoughtfulness and consideration, and it should be. In 8 months the pigs have grown to a weight of about 280 pounds. That’s a lot of bacon and chops. Every year we change our decisions on the type of cuts we want. 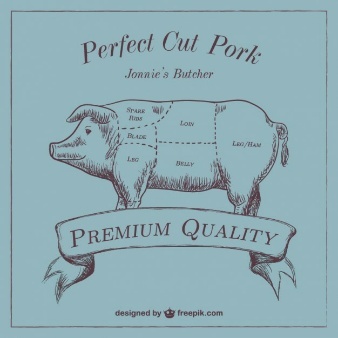 We have found that we eat more pork in the form of roasts than chops. We smoke a few of the hams and leave the others fresh. We consider what will go into ‘grind’ for sausage making and what we will be cubed for quick meals. The roasts we cut get smaller as the number of people in our household dwindles. Always decisions to make. Then there’s the bacon…….we never want to skimp on the amount of bacon we have on hand. Both the bacon and the hams ( and the hocks) will all be brined and then smoked here. The fresh bacon will be smeared with a combination of maple syrup, brown sugar, and salt, then left for about 10 days to cure. The hams and the hocks will be put into a liquid brine solution of hard cider, brown sugar, and some spices. After they cure, we will smoke them in a homemade smoker. 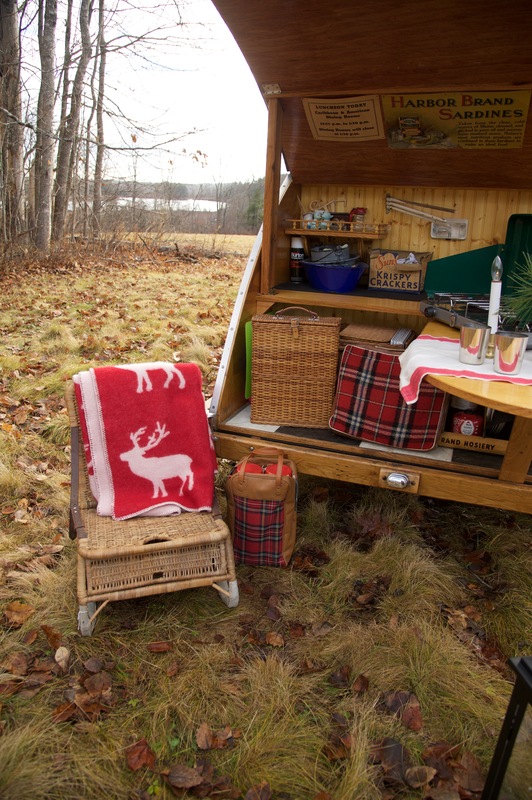 The smoker is nothing fancy….a large wooden box with loose seams to let out some of the smoke and a small woodstove that fits neatly inside. The meat will hang inside or be placed on the racks we’ve made and then smoke for about 4-5 hours at a controlled temperature of 150-155 degrees ( a higher temperature will cook the meat instead of just smoking it). We are very grateful for this home grown/home processed food we raise. Our trips to the grocery store are fairly infrequent even in winter….and it’s nice to breeze right by the meat counter knowing all that we need is carefully and safely preserved back in our own freezers. Often, if we’re not starting our winter mornings out with a hot bowl of oatmeal, then a plate of fresh eggs, homemade sourdough toast, and strips of home-raised bacon may be on the menu. You may want to consdider coming for breakfast! Just as we had been put on hold this past spring with regards to the nursery and gardens, while the winter’s weather lingered on into the warmer months and caused us to postpone certain early seasonal tasks, we are now experiencing another unusual climate trend that has altered our ‘to do’ list. Most everyone has been somewhat grateful for the mild temperatures we’ve been experiencing throughout the fall. 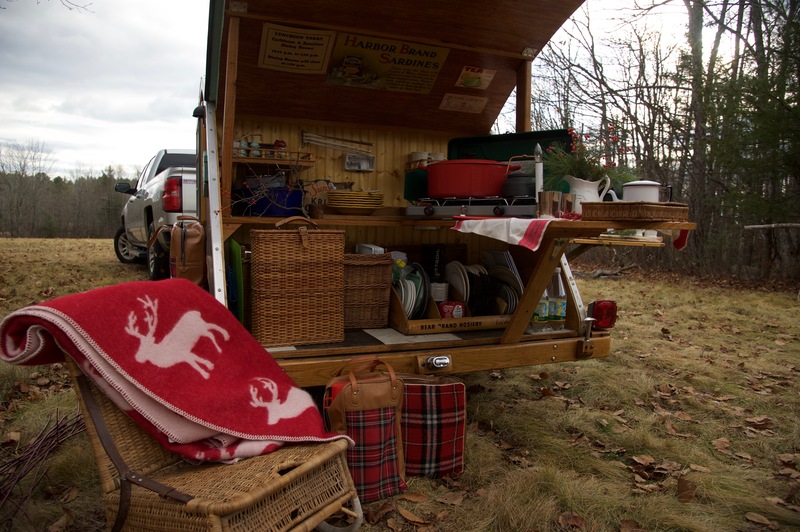 It has given us a chance to feel less harried about the many things that need to be done before winter sets in. Here at the nursery we continue to tackle projects outdoors with an eerie sense that we’re getting away with something. We are, right? It’s not supposed to be THIS warm, is it? If you have lived in the Northeast your entire life you know very well what the weather can do from October on….. Cold. Sleet. Snow. Even a bone chilling rain. We have to admit that these lovely fall days have given us time to ‘finish’ things up without scrambling. We have continued to work in the gardens, amending soil and cutting things back. 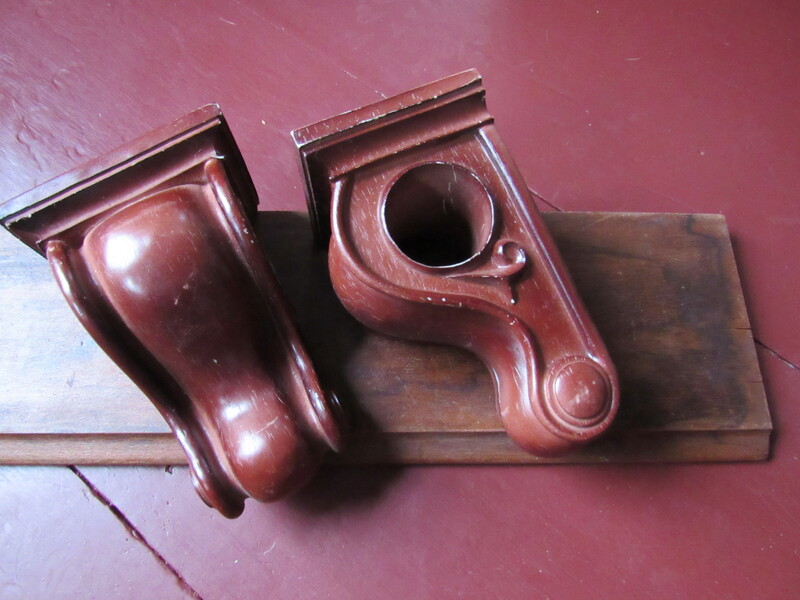 The ease of continuing to work on the studio, without tramping through snow, has been a blessing. 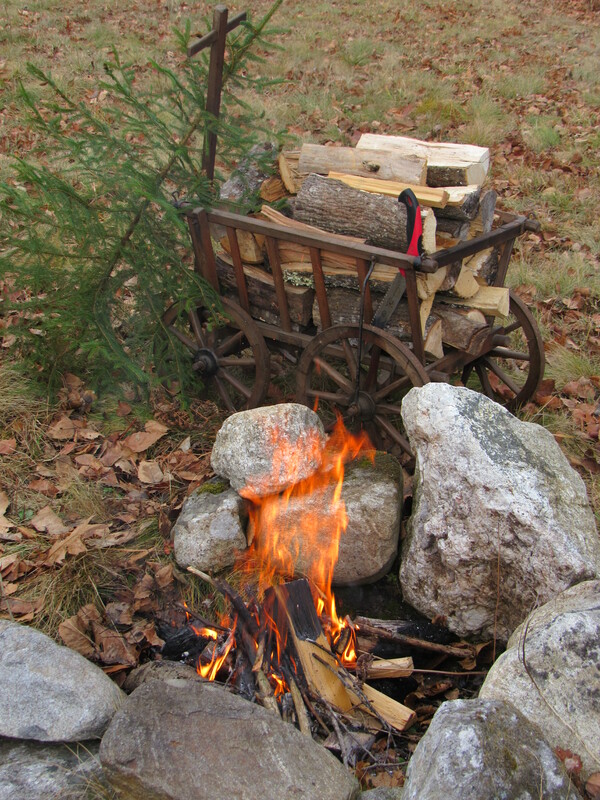 We’ve been cutting and hauling firewood, moving equipment, and pulling fence, all without having to endure bitterly cold temperatures and a slippery slope. However, we are doing these things while also being mindful that this change in temperature is not necessarily a gift….it’s a result. If you care to read about the causes ( both natural and human) of climate change, please consider reading this article: http://www3.epa.gov/climatechange/science/causes.html As we reap the benefits of this mild autumn, I can’t help but consider some of the real reasons behind these seemingly endless warm weather days. I understand, as the article clearly points out, that a natural change in weather patterns can be traced for over millions of years. The difference is that the rapid change in climate is most pronounced after the industrial revolution. I think we’d be kidding ourselves to believe that our human impact on the earth and the atmosphere is not significantly responsible for the increase and extreme nature of these changes. It brings a little heaviness to those gorgeous days, doesn’t it? We can’t just wish the damage that has been done to go away, we are reminded of the reality every time we step outside these days leaving our winter jackets on their hooks. So, do we stop enjoying a warm sunny day? Do we feel perpetually bad about ourselves as humans every time the temperature hovers around the high fifties in late fall? No, I don’t think that’s the answer. But we can be mindful of the change that is taking place, why it may be happening so quickly, and commit to doing as many things as we can to discontinue any great further damage. Having this as part of a solution allows us to feel invested in our days here as we live on planet earth. Let’s do our part….for all the days ahead.